Free Shipping Included! Linksys USB 3.0 Ethernet Adapter, Works with MacBook Air, Chromebook, or Ultrabook (USB3GIG) by Linksys at Home Entertainment Centers Online. MPN: USB3GIG. Hurry! Limited time offer. Offer valid only while supplies last. 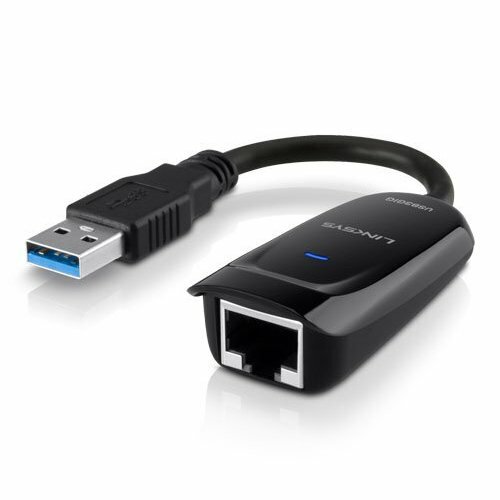 The Linksys USB Ethernet Adapter (USB3GIG) is the perfect solution for the business traveler that prefers the speed of Gigabit Ethernet to Wi-Fi. The Linksys USB Ethernet Adapter (USB3GIG) is the perfect solution for the business traveler that prefers the speed of Gigabit Ethernet to Wi-Fi. Simply connect the USB3GIG to your MacBook Air, Chrome book or Ultra book's USB 3.0 port and the Ethernet port to a router to get an ultra-fast wired connection. With the Gigabit Port, you'll get high-speed data transfers, which is great for downloading large files or streaming media. Its compact design makes it easy to carry and the travel cap keeps it protected. The Linksys USB Ethernet Adapter Gigabit USB 3.0 is the perfect solution for anyone who requires ultra-fast wired speed. The USB3GIG works with MacBook Air, Chromebook, or Ultrabook. It requires Windows XP, Windows Vista, Windows 7, Windows 8, Windows 8.1, Chrome OS, or Mac OS X 10.8 or 10.9.